Rhys Williams from Quietroom argues we need to think outside of our protection bubble if we are to engage with customers. We think about protection every day. We go to meetings and conferences where it’s the only topic of conversation. We read trade magazines, and websites, and special reports dedicated solely to the subject – and we enjoy it. If there was a pub quiz round on Barrett’s Oesophagus or Lupus Erythematosus, we would walk it. I wear the ‘protection geek’ badge with pride. But I know it also poses a problem for me, and others like me. The more we know about a subject, the harder it is to communicate with people who know less than us. We say too little – because we assume our audience knows more than they do. We say too much – because we assume they care as much as we do about the detail. 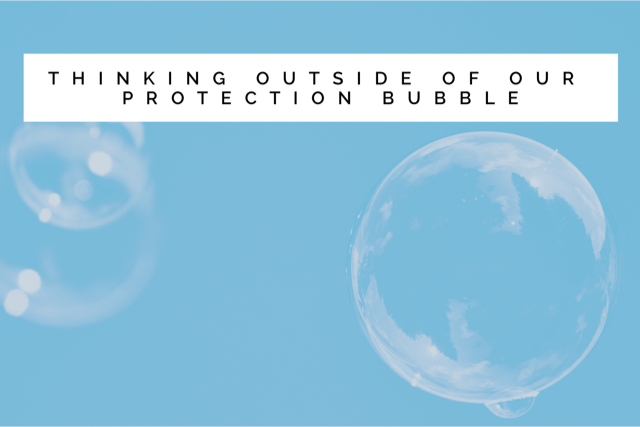 We talk in a way that makes perfect sense inside the protection bubble – but sounds like nonsense to everyone else. This is a problem for two reasons. First, it stops us growing our businesses. No business can expect to thrive unless it can reach the right people, in the right numbers, with a message that connects. Second, it stops people engaging with us, and therefore buying the protection they need – catastrophic news for them if they fall ill, become injured or die. To give our businesses the best chance of success, and our customers the best chance of leading prosperous lives, we have to do a few things differently. Here are some observations I’ve made while trying to make protection more meaningful to more people. A cursory Google for health insurance, life insurance or one of the multitude of related products, reveals an almost messianic focus on getting someone to go through our quote process. The most common hook is price - but that’s only one side of the value equation. A time-limited discount might get me through the turnstiles if I’ve already walked right up to them, but if I’m sat at home in the warm, it’s not going to get me up off the sofa. Our other obsession is speed. Get a fast quote! Get an immediate quote! Get a quote last July, months before you even realised you needed one! Do we really think there’s a latent market of customers who are being put off by the slowness of our quotes? Then there’s our keenness to sweeten the deal with an offer: a £60 Amazon voucher here, a case of wine there. Where’s the link with what we’re offering? Do we think giving bottles of booze away to people who might be concerned about their health paints our industry in the best light? Where will our generosity end? With us buying each and every customer a speedboat? We know that people don’t want to think about getting ill or dying. But our reluctance to address these subjects curbs our ability to draw people in. Illness and death have in-built drama and emotional weight, which is why they turn up so often in books and films. You can’t say the same about ‘bumps in the road’ or ‘life’s unexpected twists and turns’. That doesn’t mean we should go to the other extreme either. Over-dramatising can put people off just as much. I look at a lot of protection copy and one of my favourite ever examples asked the reader, ‘If you were in a fatal traffic accident, would anyone else be left in the financial mire?’ They didn’t capitalise FATAL TRAFFIC ACCIDENT, but they might as well have done. The most effective protection copy I’ve read treads the right balance between these extremes. It talks about ‘upheaval’, ‘trauma’ and ‘money problems’, rather than ‘cataclysm’, ‘anguish’ or ‘debtors’ prison’. It touches people emotionally, without terrifying them, and it’s more effective as a result. I’m not even sure it’s a feature – well, not one that anyone wants to hear about, at any rate. What does it even mean? Don’t answer that. I know what a deferred period is, of course. You know what it is. But the other 100% of the audience? No clue, surely. Even if they are familiar with the term, it can’t be anywhere near the top of their consideration list when they’re comparing products. Even so, ‘a wide range of deferred periods’ did indeed crop up in a list of jaw-droppingly underwhelming benefits I found when researching different insurers’ websites. I found another insurer promising me ‘a teleinterview over the phone to ensure [their] records are accurate’- as if a chat with an underwriter was all that was needed to tempt me to open my wallet. Another told me their claims team ‘focus on conversation not paperwork’. Call me old-fashioned, but I’d like them to focus on both. It’s not a universally popular position, but I like regulators and I like lawyers. That’s because they’re primarily there to protect consumers, who I like even more. But believing in the importance of regulation and legislation and valuing the contribution of the people who enforce it does not mean accepting every piece of text they insert verbatim. ‘Compliance copy’ can only protect consumers from risk (and providers from fines) if the reader understands it. If they’re confused or alarmed, and that makes them stop reading, it’s not compliant. Read any website or brochure from an insurer and you’ll be able to spot the copy the lawyers have added from a mile away. Sometimes it’s legal language to explain legal concepts – which I can just about forgive as long as it’s backed up with a more consumer-friendly explanation. What I can’t forgive though is non-legal concepts explained in legal language. It’s like serving up chicken nuggets and insisting everyone calls them goujons. When we say ‘I am in receipt of your correspondence’ instead of ‘I got your letter’, it’s a sign that things have got out of control. My favourite example of this was finding the term ‘protective undergarments’ in a reinsurer’s terms and conditions. They meant incontinence pants. That’s what people call them. So why not say it? Wondering if it had some technical insurance application that I wasn’t aware of, I Googled the term. There was only one mention of it on the internet – and that was on the reinsurer’s website. Let’s begin by establishing why people need what we’re selling and root it in the reality of their lives. Let’s focus less on price and special offers, and more on value. That means really selling the benefits of our products – not just what they do, but the difference they can make to people. Let’s not be afraid to engage with the emotional impact of illness and death (while being careful to steer clear of sensationalism). And above all, let’s remember that, if we’re going to connect with people who don’t think about protection as much as we do, we should use language that invites them in.